Worth checking out; Skipper features including project import, standardized ORM definitions export, visual model editing, error-free definitions, fast navigation and Skipper customization. The Rancher container management platform has become an increasingly popular way to manage containers—it’s been used to deploy tens of thousands of clusters. With Kubernetes becoming the fastest developing technology in the container ecosystem, we saw an opportunity. And rebuilt Rancher on Kubernetes. Rancher 2.0 provides the same great user experience on all Kubernetes clusters, whether they are managed using Rancher or existing Kubernetes clusters. The result? It’s now even easier for you to adopt Kubernetes and run containers. If you’re a professional WordPress Site developer this plugin (yeah this monster is actually a plugin) is a must look. So what is it? It’s version control for WordPress…. on steroids! “VersionPress tracks all the actions in a WordPress site and simply offers an undo button for them. For example, if a plugin update failed, the undo button reverts its files and any database changes the plugin might have made. I’m definitely following this project as I have it installed on two sites and hoping for WP MU support and Multiligualpress support! They’re working on Woocommerce and WPML. We’re excited to announce the release of Ext JS Stencils 2.0, an update to our UI kit for Illustrator, Sketch, and Balsamiq. Stencils 1.0 for Omnigraffle featuring components from the Classic toolkit can still be downloaded. PNG and SVG are also now available and can be imported into any program. All of the components that exist in Ext JS have been converted into visual assets that will help designers create UI mockups. In Stencils 1.0, Ext JS Classic toolkit components were available. In this release, we’ve created Stencils for all of the components available in the Modern Toolkit as well. These Modern Toolkit assets work with the Triton and Neptune themes. Having Stencils that emulate the Modern Toolkit is helpful for designers and developers who are creating mobile or universal applications. Using Ext JS Stencils, designers can effectively communicate their ideas to developers quickly and efficiently. The design process starts with a rough idea that becomes refined after several iterations. The first and most crucial step in the design process is ideation, and it has never been easier with the use of Stencils. 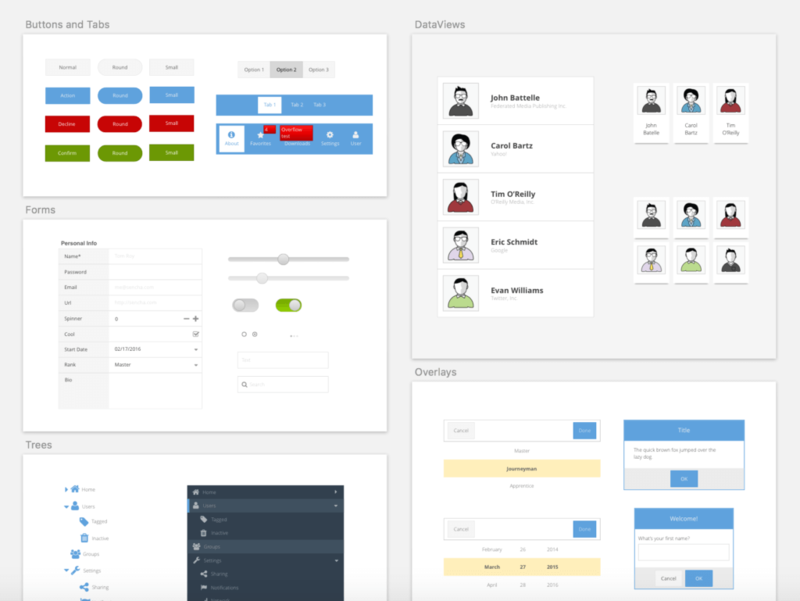 Designers can simply drag and drop the pre-made components to build their mocked up applications. Using Stencils will expedite the ideation process which will allow designers to efficiently share their ideas and quickly alter any of their designs, if necessary. Sketch is a simple vector drawing program that has become popular for designing user interfaces. In our first release of Stencils for Illustrator, users were able to drag and drop symbols from the symbol library onto their canvas to create their designs. Now, users will find that same functionality within the Sketch symbols library. The Symbols feature allows designers to easily reuse elements across all artboards and pages. We have organized our symbols in the Symbols menu using categories including Buttons, Form Fields, Grids, etc. to make it easier to find a specific component. 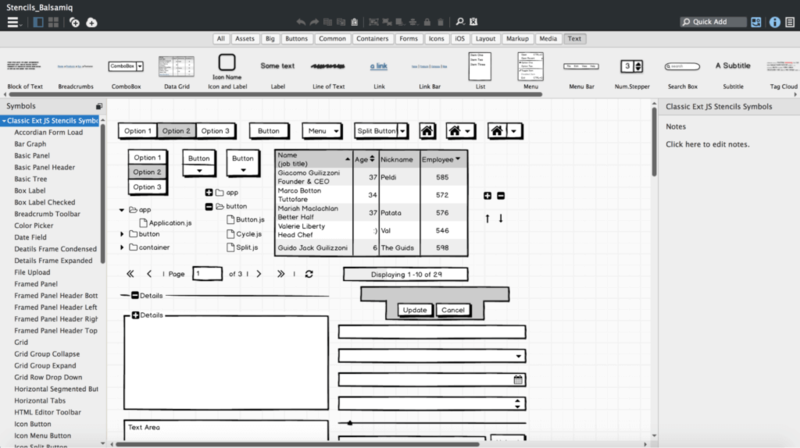 Balsamiq is another popular tool for rapidly drawing wireframes. For those who are interested in creating low-fidelity wireframes, we have converted all of the Ext JS components into symbols using Balsamiq. The ability to produce multiple iterations of a design in an efficient manner is key to developing great products. Ext JS components can be found in the UI Library using the Symbols filter. Balsamiq makes it easy for designers to rearrange components to form different iterations of their design. We used Stencils to construct sample wireframes that can be found in the Illustrator and Sketch files. 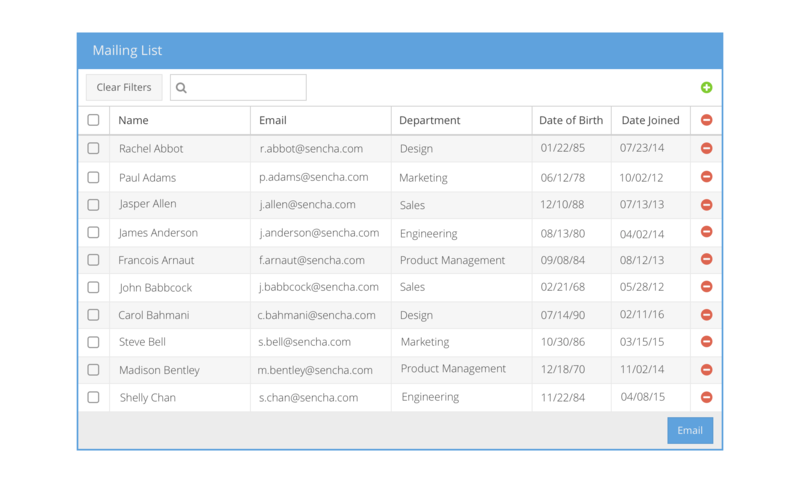 In this example, we created a Mailing List application that demonstrates how an array grid can be implemented in a design. 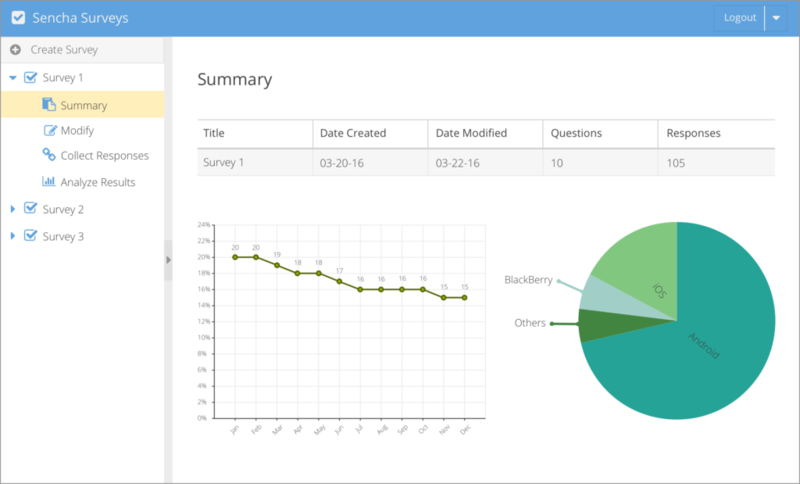 In the following example, we designed a survey application that uses a tree navigation, grid, buttons, and graphs. With the addition of support for the Modern toolkit, new features in Sketch, and Stencils for Balsamiq, we have our most complete design asset kit yet. We use Stencils to create mockups for Sencha products, and we hope that you find these UI kits as useful as we do. Share your feedback in the Comments and let us know how you’re using Stencils. Stencils 2.0 for Sketch – This video shows how you can quickly create application mockups using Ext JS Stencils. The Ultimate HTML5 App Builder. Build apps using Sencha Architect 3 and reach more people on more platforms leveraging HTML5. Sencha Architect 3 is the fastest way to build HTML5 apps for the web and mobile devices. We are pleased to announce the immediate availability of Apigility 1.0.0beta1! http://apigility.org/download This is our first beta release of Apigility, marking its initial API stability, and providing a solid preview of what to expect for the first stable release. What is Apigility? Apigility is the world’s easiest way to create and provide secure, well-formed APIs. Apigility provides tools for describing and documenting your APIs, both RESTful and RPC. You can indicate the URL that provides a service, what HTTP methods are allowed, what representations e.g., JSON, HTML, XML can be provided, how many items to present per page of a collection, and more.